A few have sought my views on it wondering ,like this Broking House who recommended long term risk investors clients to average in the Rs 26 to Rs 28 range , whether it’s a good buy now ! Blog Reader : Hi Gaurav, Introducing myself, my name is _____ and I work with the ____ group.I am quite passionate about Indian stock market and I read your blog with great interest. The insights given by you are great.Regarding your latest blog on Bodal, I was following this stock – I read both buy and sell reports of ______ – I myself bought at 40 and exited at 62 when I saw that the promoters were selling.What I want to ask you is what is the real value of this stock. It has posted handsome earnings in Q1 and is slated to give good earnings in Q2 as well, depending, of course, on HAC prices, which have been fluctuating widely.Q1 FY15 EPS – 4.8 Q4 FY14 EPS – 4.1….Even if it can give in FY15 an EPS of Rs. 15, I would consider it damn cheap at a price of Rs. 32 odd now.What do you think? Please give your views. Will the Sensex close over 24000 for the first time on Election Outcome Day Today !? Will the Sensex close over 24000 for the first time on Election Outcome Day Today ! ?….Singapore Nifty is up 1% early Indian Morning ! Will FIIs pump in a record US $ One Billion today or Monday and a further US $ 20 billion in the next six months !? How many will announce IPOs in the next three months…..25 companies….50 companies…100 companies !? Indian Rupee strengthens 10 % at least to US $ = Rs 54 over next six months !? Will India GDP show an uptick of at least 1 % to cross 5.5% in FY 15 !? From Vibrant Gujarat to Vibrant India & a Vibrant Sensex & Saffron Indian Skies !? ….or will we have kissed 24000 and fade away back to 22000 in quick time !? Posted in Broker Index Forecasts, Economy, Foreign Institutional Investors, Inspiring and Motivating, Investing Approaches, Investing Themes, Politics~India, Reflections, Sensex, STOCKS, VALUATION	Tagged Will the Sensex close over 24000 for the first time on Election Outcome Day Today !? Sensex 24000 & Nifty 7100 ~ A Final Short Term Flourish coming up ? Sensex & Nifty at Record Existence Highs of 24000 and 7100 respectively ~ A Final Short Term Flourish coming up ? However there is evidence of Index Management as the Market plays out the euphoria of this expected and projected BJP & NDA Win…SEBI has already sent a notice to an individual broker who went long Rs 2000 crs in just one single day on Friday,May 9,2014 ! when his past trading record showed a significantly smaller volume of operations ! Investors need not be perturbed as the Indices are establishing a stable base range of 22000 to 25000 for the Sensex and 6500 to 7500 for the Nifty for the years ahead….Forecasts of 25000 and 30000 are being made by Capital Market Players in the next 6 to 9 months…Many reckon it is the start of the ‘Mother of All Bull Runs !’….they had reckoned similarly even 10 years ago ! Am I being a Party Pooper in the Short Term ! ? Well, Maybe…but considering Near Term Risks,Sometimes it’s Wise to be Wrong Too ! Posted in Broker Index Forecasts, Derivatives Strategies, Foreign Institutional Investors, Insider Trading, Inspiring and Motivating, Interesting News Sightings, Investing Approaches, Investing Themes, INVESTOR MISTAKES, Nifty, Politics~India, Reflections, Sensex, VALUATION	Tagged Sensex 24000 & Nifty 7100 ~ A Final Short Term Flourish coming up ? 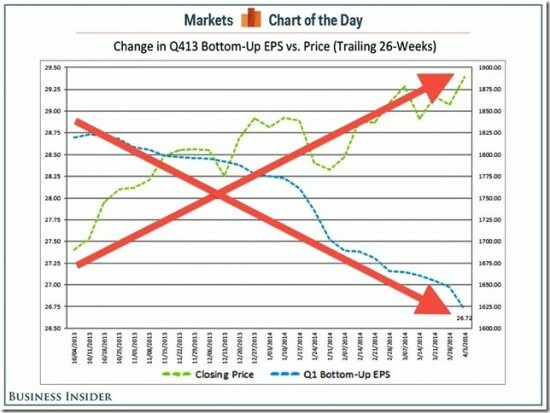 US Stocks Beginning to Bubble ? Should India Worry ? 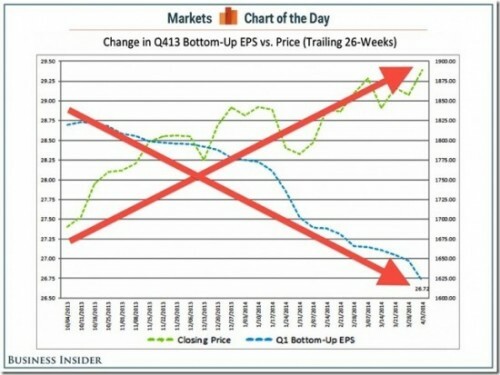 US Stocks Beginning to Bubble ? 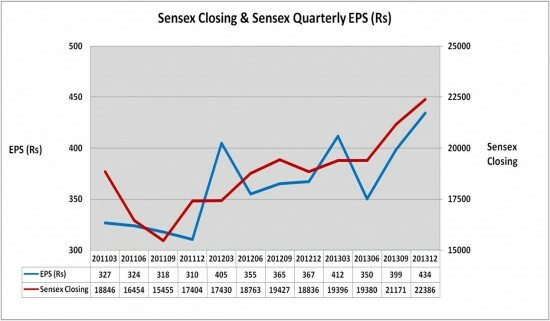 The Indian Situation is actually different as the Sensex vs EPS Graph below depicts…so should we be really worrying too much looking at US Potential Crash Scenario being replicated here !? Then Sensex swiftly towards 25000 from current 22500 levels ? Will the US Scenario not Matter ? What about strong FII Inflows of US $ 4.5 Billion in 2014 so far propping up our Sensex ? Will this Liquidity continue even if Interest Rates begin rising in the USA later in 2014 as QE eases out ? 🙂 Sensex 27000 Anyone later this year ? Posted in Broker Index Forecasts, Economy, Foreign Institutional Investors, Global Economic Crisis, Inspiring and Motivating, Interesting News Sightings, Investing Approaches, Investing Themes, Investor Gurus, INVESTOR MISTAKES, Reflections, Sensex, STOCKS, VALUATION	Tagged US Stocks Beginning to Bubble ? Should India Worry ? Grantham of GMO say the next Bust will be Nothing Like You Have Seen Before ! “….. to invest our clients’ money on the basis of speculation being driven by the Fed’s misguided policies doesn’t seem like the best thing to do with our clients’ money…….We invest our clients’ money based on our seven-year prediction. And over the next seven years, we think the market will have negative returns. The next bust will be unlike any other, because the Fed and other centrals banks around the world have taken on all this leverage that was out there and put it on their balance sheets. We have never had this before. Assets are overpriced generally. They will be cheap again. That’s how we will pay for this. It’s going to be very painful for investors. Posted in Broker Index Forecasts, Controversies, Corporate Governance, Global Economic Crisis, Inspiring and Motivating, Interesting News Sightings, Investing Approaches, INVESTOR MISTAKES, Reflections, STOCKS, VALUATION	Tagged Grantham of GMO say the next Bust will be Nothing Like You Have Seen Before !